There's a popular perception among foreigners that in Australia every shoe, beach and toilet seat is crammed full of deadly poisonous creepy-crawlies. Well, on the one hand, yes, we've got a lot of poisonous things here. And crocodiles, and stuff. But the most deadly animal in Australia, in deaths per year, is apparently the European honeybee. People get bitten by nasty spiders and snakes all the time, but unless it happens while they're out in some trackless wasteland with no access to antivenom (in which case they might also not make it into the official statistics), they all survive. Steve Irwin had to go to some really extreme lengths to find something that'd actually kill him. But then again, there's this. 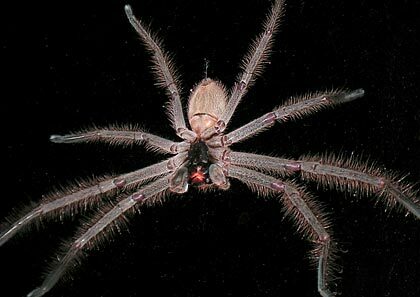 Huntsman spiders are found, in one variety or another, all over the world. They're common in suburban Australia, though. Australian houses are seldom tightly sealed and double glazed, and huntsman spiders are wide and flat, so they can and do sneak indoors. The above example, a mere four inches or so across (this strain grows to about six inches across), was on the outside of the kitchen window, so you get to see the less common "ventral aspect". Or, to put it another way, his underside. I think it's a him. Huntsman males and females are similar in size (many spider species have tiny males and big females), but huntsman males have a smaller abdomen. 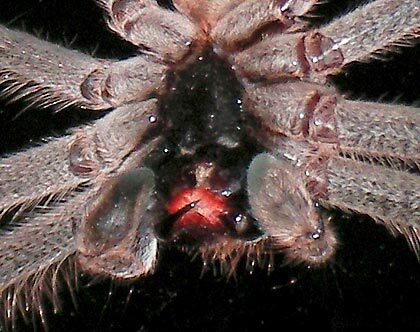 Huntsman spiders are physically harmless - you can get bitten by one of them if you really try, but if you then go to the hospital they will point and laugh at you. But they're psychologically traumatising for many people. Including me, though I've managed to become slightly saner about them over the years. Huntsman spiders, you see, really are hunters. They don't hang around in a web waiting for food to come to them; they sit still most of the time, but when prey presents itself they go after it, at speed. They can use this same turn of speed to avoid capture, and they are perfectly capable of locomoting at a full gallop sideways. It's the sideways-ness that bothers me most. But that's probably only because I don't often spend time looking at the ventral aspect. Given the commonness of Australian huntsmen, it's surprising that there don't seem to be any on the otherwise excellent What's That Bug. What's That Bug has also, by the way, convinced me that North Americans can just shut up about scary insect monsters in Australian houses, given the commonness of house centipedes over there. Not to mention things that are actually called "toe biters", and whose bites are (a) much more common and (b) far more painful than huntsman bites or, apparently, the bite of any other insect - though they admittedly won't actually kill you. I suppose you'll do that yourself, after half an hour or so. Eep! Posts like that should carry a warning! I think I'm going to need a unicorn chaser. 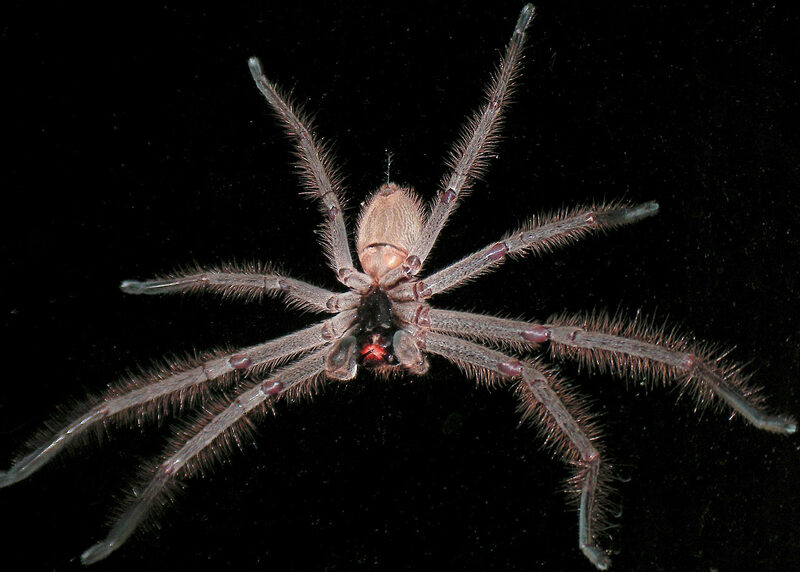 That said with the drier conditions this year, one kind of loses any fear after relocating (using the big glass and piece of paper method) the nth hairy legged terror. lately I've been leaving them in situ, as removal has seen an increase in white-tail spider numbers in the house. Lovely. I have killed a few of those house centipedes recently in my kitchen. The North East USA has been having a rather warm December and I think they are a bit confused and wandering about. I hate the creepy squirmy suckers. If you come up out of the basement you're dead. Stay down there and eat each other dammit! Huntsmen are great spiders, and you get them here in South Africa too (where we have other names for them, including Lizard-Eating Spider). While not as big as some of the Aussie species, they can still be quite fun when you encounter them in the dark in your house. Here is a rather exciting view of one I found a while back, you can see how big this individual was in this picture. Judging by the size of the pedipalps on the spider in your picture I'd hazard a guess that it's a male (males generally have bigger pedipalps than females). A few days ago I found a dead female in my bedroom. Not being sure why it was dead, I've currently got it in a container next to my PC monitor so I can see if it was killed by a parasitic wasp. It would be really interested if something emerged from this spider in a few days time. If Australia ever gets tired of tourism, those photos are sure to scare off anyone. We've only just gotten huntsman spiders here, leaked from Aussie somehow... more bad news for someone who hates spiders. I once 'saved' a huntsman by throwing it out of the back door into the yard. Unluckily for it, the yard was patrolled by a group of Bantams. The evolution of birds from dinosaurs was never so clear as they descended on the hapless spider like a pack of raptors on crack. The poor devil was torn apart in a frenzy of leaf litter, feathers and stabbing beaks . That was the first and only time I have felt sorry for a spider. As it turns out, Aus has some damn fine centipedes to add to the list of things that could make you feel poorly. I'm quite familiar with the North American house centipede as they invaded my old flat every winter. They're usually only about five or seven centimeters long but they can grow much, much larger if they live long enough. Even small, they're just damn creepy. The worst one I ever saw was about 25 centimeters long; my immediate, instinctive reaction upon seeing it flying across my flatmate's floor in the middle of the night was to grab his shoe and beat it into a fine paste. Video clips are of course included in that article (linked at the end of the text). One of the most fascinating things was that these centipedes have adapted to clive up to cave roofs, hang back down using their hind legs to grip on to the surface, and then grab bats as they fly past. North-American house centipedes are only scary in close-up photographs. In real life they're so flighty that it's pretty well impossible to be frightened of them. You turn on a small desk lamp and they flee the scene in obvious terror, practically tripping over themselves, unsure which way to turn in their rush to escape. They'd be funny if they weren't so pitiable. Dan: I was just re-reading this old post from a Reddit link of yours, and while creeping myself out by watching those pics and reading about spiders that run and jump, a bag I haphazardly positioned on a chair half an hour ago succumbed to gravity and fell, producing a small noise that was amplified by my state of deep alertness into a reaction of pure terror. I jumped on my chair flailing wildly and hit my phone with an aimless gesture of my hand; the phone sailed a good two metres in the air and landed, by sheer luck, on a shoe - and was therefore undamaged. It is interesting that things you wrote almost seven years ago are still threatening to destroy hi-tech electronics today. I don't know if I should congratulate you or curse you.